Testimonials- Thank you for the great comments! Dr. Shatkin is an outstanding physician with great experience and an excellent judgement. The result of my face lift far surpasses all my expectations. He really cared about my personal needs and what is best just for me. Besides my wishes he carefully gave advise, what to do. Therefore I didn't feel pushed and followed along. By now I am extremely thankful for his input and know that he was right. A face lift is a physical as well as a psychological intervention and I was very carefully looking for the right physician. It is all about trust and Dr. Shatkin was the perfect choice. Only three days I had to take the pain medication, day four and five I needed only half the amount. That's it. It was unbelievable. The healing process was quick and I was out in the public already after ten days! His key advise: don't do anything, pamper yourself and sleep in the most possible up-rite position. That did the trick. The swelling dropped quickly and I could see the great results. My look is fresh and youthful and nobody has any idea that I had a face lift. This is exactly what we all want. Therefore I highly recommend Dr. Shatkin. I can't thank you enough for the incredible care you gave me before, during and after my surgery. As you know, I've gone through a lot over the years with numerous surgeries. You made sure that NO stone was left un-turned. Your office staff worked so hared to arrange my surgery with my other surgeon so I would not have to go through major surgery twice. You even performed the surgery at a hospital you normally don't do surgery at because of my unique situation. Lastly...I Look and feel incredible! The outcome far exceeded my expectations. You are a true miracle worker!" 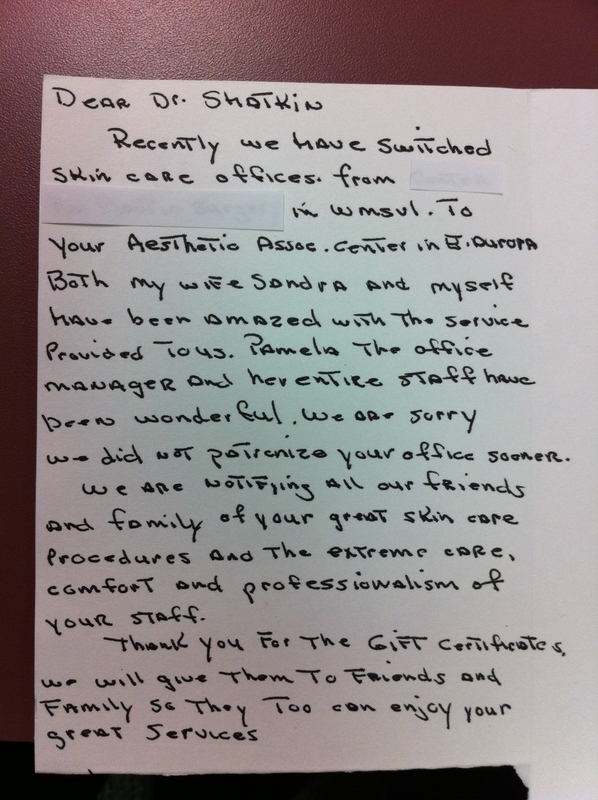 Recently we have switched skin care offices from ______ in Williamsville to your Aesethetic Associates Centre. Both my wife Sandra and myself have been amazed with the service provided to us. Pamela the office manager and the entire staff have been wonderful. We are sorry we did not patronize your office sooner. We are notifying all our friends and family of your great skin care procedures and the extreme care, comfort and professionalism of your staff. Thank you for the gift certificate, we will give them to friends and family so they can enjoy your great services." 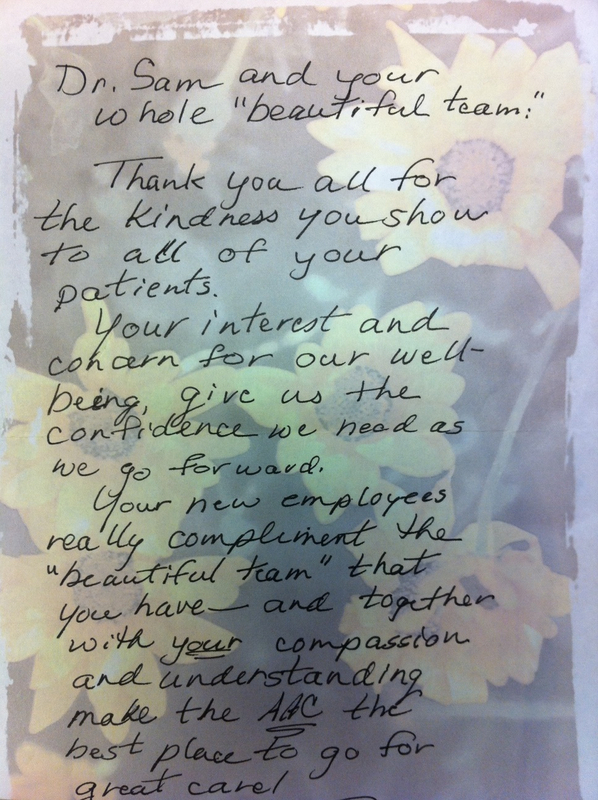 Thank You all for the kindness you show to all of your patients. Your interest and concern for our well-being give us the confidence we need as we go for ward. Your new employees really compliment the "beautiful team" that you have and together with your compassion and understanding make the AAC the best place fo go for great care!" Here is one Dr. Shatkin recently received from a 10 year old boy following repair of his facial lacerations in the emergency room. The card was accompanied by 3 cards from his favorite hockey card collection. Click Here to see other patient testimonials from Doctor Shatkin's patients.